Looking at our brand new adventure playground, which incorporates a mountain stream, even adults wish they were a child again. Some cannot resist the urge and dive headlong into the fun together with their children. A family holiday on a farm close to the idyllic village of Eggen is full of great ways to spend the day. The farm animals enchant the children and the outings with mum and dad are fun too, but the beautiful adventure playground is the cherry on top. Climb, dig, bounce – all day long! 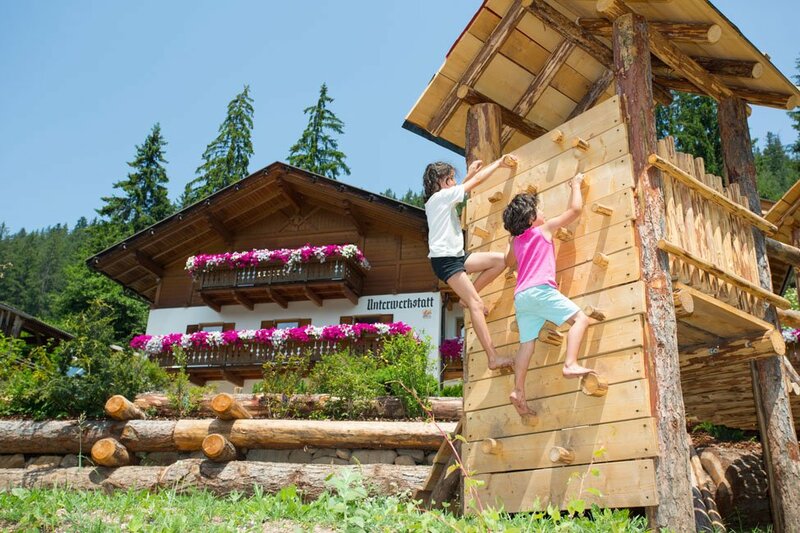 Whether they scramble over the rocks or try out the climbing wall, your children will love the playground’s variety. 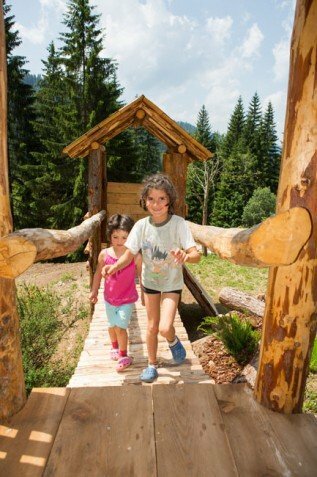 Cross a rope bridge and scale some rocks and you’ll reach our Wendy house – the ideal place to play “knight and princess”. In summer the rocks heat up and can double up as dragons’ nest. Fantasy can run riot on our adventure playground. In the large sandpit you can dig to your heart’s delight and build sandcastles. The little waterfall lets you cool off on those hot summer days. The children can let off steam on the trampoline or organise their own foosball tournaments. We wish you lots of fun with our new adventure playground on our family farm.